Taking Flight is an easy baby quilt pattern made by joining twelve traditional Birds in the Air quilt blocks and six Thrifty blocks. All blocks are sewn on point and surrounded by setting triangles. Two straight (butted) borders complete the quilt top; the outer border of the quilt includes cornerstones. 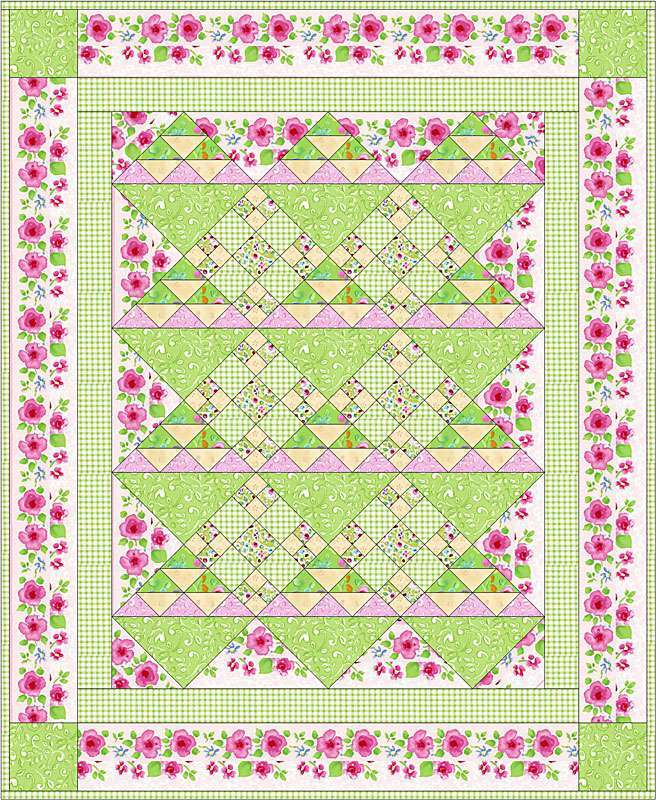 The Taking Flight baby quilt pattern works nicely with spring and summer look of green and floral pink fabrics touched with white, but any theme you choose will be perfect. Finished Baby Quilt Size: 39-1/2" x 47"
Finished Block Size: 6" x 6"
Backing: 1-1/2 yards if you use a single panel for backing -- will be about 43" wide, or only a few inches excess on each side. Buy 3 yards and construct a wider panel if you want extra width. Batting: About the same size as backing. Continue to 2 of 4 below. Cut (6) 6-7/8" x 6-7/8" squares. Cut each square in half once diagonally and set aside. Cut (18) 2-7/8" x 2-7/8" dark pink squares. Cut each in half once diagonally and set aside. Cut (18) 2-7/8" x 2-7/8" dark green squares and (18) neutral squares of the same size. Use my easy sandwich method to combine unlike squares in pairs, resulting in (36) half square triangles that each measure 2-1/2" x 2-1/2" when complete. Arrange three half-square triangle units and three pink triangles into three rows as shown in the drawing, lower left. Sew components of each row together. Press seam allowances in adjoining rows in opposite directions and then sew rows together. Press. Center and sew a large green triangle to the longest edge of the unit created in step 5. Press seam allowance towards the large triangle. The Birds in the Air quilt block should measure 6-1/2" x 6-1/2". Repeat, making a total of 12 Birds in the Air quilt blocks. Continue to 3 of 4 below. Cut two 1-1/2" x 42" (selvage to selvage) strips of neutral and two small-scale green floral print strips of the same size. Sew contrasting pairs of strips lengthwise to make two strip sets. Press seam allowances towards the darker fabric. Square up one end of each strip set. Cut a total of (48) 1-1/2" segments from the sets. There's enough extra length to allow squaring up as needed. Repeat to make a total of 24 four-patch units. Cut one 2-1/2" x 42" strip of gingham fabric and one 2-1/2" x 11" strip of gingham. Cut a total of (24) 2-1/2" x 2-1/2" squares from the strips. Cut one 2-1/2" x 17" strip of small-scale green floral fabric. Cut a total of (6) 2-1/2" x 2-1/2" squares from the strips. Arrange four four-patch units, four gingham squares and one green floral square into three rows as shown (illustration, lower left), placing the green floral square in the center of the middle row. Sew components of each row together. Press seam allowances towards the gingham squares. Sew rows together, butting seam intersections for a perfect match. Press. The Thrifty quilt block should measure 6-1/2" x 6-1/2". Repeat, making a total of (6) Thrifty quilt blocks. Continue to 4 of 4 below. Cut (2) 5-1/8" x 5-1/8" squares from the same fabric. Cut each square in half once diagonally to make corner triangles. Arrange quilt blocks and setting triangles into diagonal rows as shown. Sew components of each row together. Press seam allowances between blocks in adjacent rows in opposite directions. Sew rows together, matching intersections carefully. Sew corner triangles to the quilt. Refer to my general border instructions to measure the quilt for borders. Sew 2-1/2" wide strips to the quilt to make the inner border. Use my borders with cornerstones instructions to add the outer border. Use 5" wide border strips and (4) 5" x 5" corner squares. Mark for quilting if necessary. Sandwich the quilt with batting and backing. Quilt by hand or machine. Trim and square up batting and backing and sew easy mitered binding around the quilt edges.